Oregon forward Elgin Cook attended Milwaukee Hamilton High School, but was not recruited by Wisconsin. MILWAUKEE — Elgin Cook is a man of few words. He’s also not used to the spotlight. But having a career night in the NCAA tournament in the city he once starred in as a prep athlete will bring the media swarm. He’s quietly answered each question that’s been thrown his way, often times having to repeat what he’s already said. Every response has been recited in the same hushed tone. "His demeanor is so humble that you can never really know if there’s a pep in his step or if he’s sad or anything," Oregon forward Richard Amardi said of Cook. "He stays so straight-faced. He walks in, does what he does and leaves." The former Milwaukee Hamilton High School star gets his chance to face his home-state team as seventh-seeded Oregon and second-seeded Wisconsin square off Saturday night at the BMO Harris Bradley Center with a trip to the Sweet 16 on the line. Cook helped the Ducks advance to the Round of 32 by scoring a career-high 23 point with eight rebounds on 8-of-9 shooting on Oregon’s 87-68 rout of BYU on Thursday. "I just wanted to come in and execute our game plan," Cook said. "My teammates did a good job of finding me around the basket so I could finish." Ever since Selection Sunday, Cook’s teammates said they’ve seen a different version of the talented forward. He left Milwaukee in the middle of his senior season at Hamilton to attend Christian Life Center Academy in Houston. This is the first time he’s played back in the city since making the difficult decision to leave. 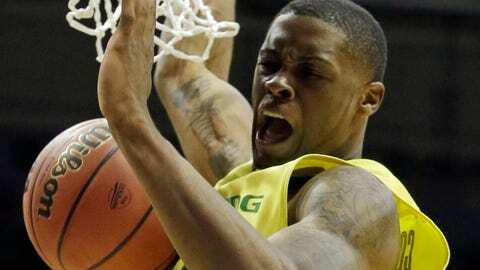 "I saw it," Oregon guard Johnathan Loyd said. "He kind of gave (Oregon guard Dominic Artis) that look like, ‘Yeah, I’m back at the crib.’ He was excited from the jump, so I expect him to keep battling like he is." Cook, the son of former Bucks guard/forward Alvin Robertson, initially committed to Iowa State but didn’t qualify academically. The City Conference Player of the Year in 2011 ended up at Northwest Florida State where he averaged 14.8 points and 6.0 rebounds last season. With his academics now in order, Cook chose to attend Oregon over Gonzaga. He’s averaged 6.8 points and 3.7 rebounds in 33 games this season for the Ducks. The same age as Sam Dekker, the Wisconsin forward remembers Cook from the basketball scene when the two were in high school. "We were in a lot of the same gyms growing up, AAU stuff and travel teams," Dekker said. "I always loved watching him play because he’s so athletic and such a good player in the city of Milwaukee, really respected in our state. "I don’t really know him on a personal level, but I’ve seen him play multiple times and he’s a guy I enjoyed seeing play." Now Cook gets his chance against Wisconsin, a school he says never showed any interest in him. But the chip on his shoulder doesn’t seem to change no matter who he is playing against. "I definitely didn’t really envision this when I went to Oregon," Cook said of playing in Milwaukee. "It’s been a fun experience. "I just want to come out, play hard and win. That’s about it." A different homecoming: Glenn Robinson III heard the roar of the crowd and wondered what it was all about. It all made sense when he looked up at the scoreboard and saw his father. Fans in Milwaukee and Wisconsin still love the Big Dog. Now they are getting a chance to see his son compete in the NCAA tournament for Michigan in the same building in which Glenn Robinson starred for the Milwaukee Bucks. "It was great," Robinson III said. "He had a great career here. It was an honor to be able to play in the same building as him. I know I had a lot of fans here personally just from him playing here." The Bradley Center is considered a special place to the younger Robinson because of the memories he has from following his father around during the eight seasons they spent in Milwaukee. Robinson III was born just five months before the Bucks took Robinson with the first overall pick in the 1994 draft and was seven years old when Milwaukee advanced to the Eastern Conference Finals in 2001. "I went to quite a few games," Robinson III said. "I remember going to quite a few practices with (coach) George Karl. I would go in there with the team, and I thought I was part of the team. That was pretty cool. It was my first time being around an NBA-level team." An NBA prospect himself, Robinson III has not made a decision as to if he’ll return to Michigan for his junior year or declare for the draft. NBADraft.net has Robinson III as a lottery pick in the 2015 draft. He said he will wait until Michigan’s season is over before making up his mind. The Bucks are expected to draft higher in the lottery than Robinson III would go, but there’s always that chance he could wind up playing in Milwaukee like his father did. Robinson was recently brought back by the Bucks to be honored during a game. The Big Dog is the second-leading scorer in Bucks history, averaging 21.1 points per game and making two All-Star teams in eight seasons. "More for him," Robinson III said of it being special to play in the same city as his father. "They still love him here. For them to honor him here still, that’s great."